An artist’s impression of the Spinola Bay embellishment project. There was little that was beautiful about Spinola Bay yesterday morning, as doubled-parked cars sat drenched alongside potholed roads, storm water scurrying past tourists’ feet. This is all set to change, however, as Resources Minister George Pullicino yesterday announced a €1.3 million beautifying project for the St Julians square. 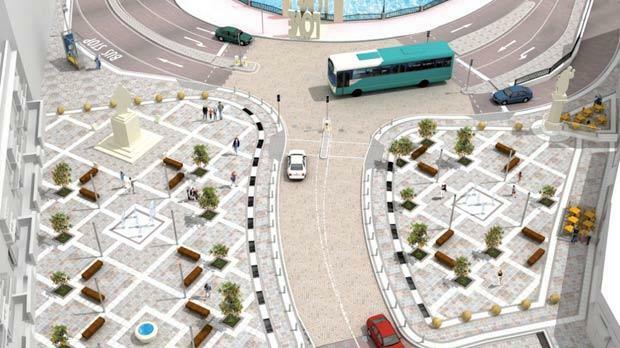 Covering a 2,400 square metre area, the project will pedestrianise large swathes of the square and lead to the removal of the existing Sacred Heart roundabout. Works are expected to begin in April 2012 and take approximately eight months. The Sacred Heart statue, currently hidden behind roundabout vegetation, will be moved to an area closer to the St Julians police station. An antique horse trough, lying derelict behind the bus stop, will be restored and turned into a water feature. Two ground fountains, several wooden benches and unobtrusive trees will embellish the pedestrian zones. Retractable bollards will be installed, allowing the local council to pedestrianise the entire square on special occasions. “This project will remove the existing chaos and confusion in Spinola Bay, placing pedestrians at the heart of the square rather than cars,” Mr Pullicino said. He pre-empted concerns about reducing parking spaces by reminding his audience that a private company will soon start construction of a 400-car car park a few metres away. The project envisages the building of a series of water culverts, which will carry rainwater into the sea. It was not feasible, Mr Pullicino explained, to reuse the water at that point. “Rainwater catchment projects must be implemented further upstream, not at the water’s end stage,” he said. Construction of the main culvert, five metres wide and 1.5 metres deep, means that underground electricity and telecommunications cables will need to be re-routed. The new square has been designed by Robert Fenech – the architect responsible for the Bisazza Street pedestrian project – and will use porfido stone for both the pedestrian areas and adjacent road. Mr Pullicino reminded his audience that the project had been unanimously approved by the St Julians local council and said it was “just one phase” in the government’s plans for the rejuvenation of the town.